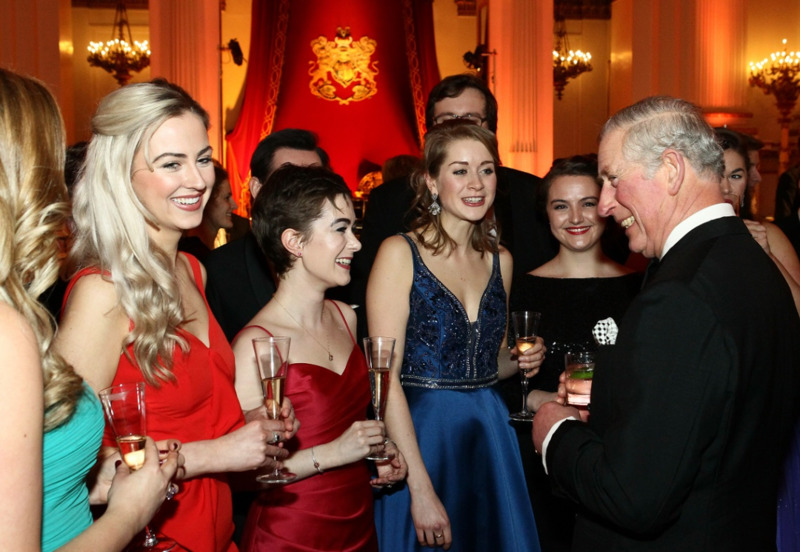 The Prince of Wales, President of the Royal College of Music since 1993, hosted a special gala evening at Buckingham Palace on 6 February to help celebrate talented musicians from the Royal College of Music. Guests, supporters and young musicians joined The Prince of Wales to celebrate the prestigious conservatoire, and the work it is doing to expand its reach and projects through its More Music Campaign. Renowned violinist Maxim Vengerov (Polonksy Visiting Professor at the RCM, pictured below with Prince Charles) and conductor John Wilson performed with RCM alumnae Louise Alder (soprano) and current RCM student Emily Sun (violin) as well as the Royal College of Music Symphony Orchestra in an evening that showcased the music and musicians from the UK’s leading conservatoire. The evening included a performance of Ein Ständchen, a song written by The Prince of Wales’ great great great grandfather, Prince Albert. The piece was specially orchestrated by RCM student Richard Miller and received its premiere at the Gala. Speaking to the audience following the concert, His Royal Highness remarked how proud and moved he was to hear the composition. It was Prince Albert whose vision led to the establishment of the creative and educative centre in South Kensington, later dubbed “Albertopolis”, and as a result the foundation of the Royal College of Music. As well as the redevelopment of the RCM’s South Kensington campus opposite the Royal Albert Hall, the More Music Campaign will support a dynamic range of projects including further support for students, new posts and programmes. More Music will not only enhance the learning environment for students but also provide more scholarships and transform the College’s public engagement programme, allowing more people than ever before to connect with the RCM in a variety of ways. The building development will include two new world-class performance spaces, additional rehearsal rooms and recording facilities, a new Royal College of Music Museum and many other enhancements. Renowned architect John Simpson has reimagined the College’s site. The More Music Campaign has received support from across the world and the RCM is grateful for the support of the Higher Education Funding Council for England, Heritage Lottery Fund, Kingdom Music Education Group, the Garfield Weston Foundation, the Wolfson Foundation, The Foyle Foundation, The Polonsky Foundation, Classic FM and Landor. Other significant gifts have come to the RCM from a wide variety of supporters, including alumni from across the globe. Thanks to this support, More Music: Reimagining the Royal College of Music has already raised 60% of the overall target. PIanist is proud to have a close working relationship with the college. It's here Pianist records its covermount CD. WATCH Pianist's Chenyin Li perform a track recently recorded at the Royal College of Music recording studios.